(VEN) - The General Statistics Office of Vietnam published a report on the socioeconomic situation in the third quarter and the first three quarters of the year. There was a breakthrough in gross domestic product (GDP) growth in the third quarter, but it seems to be hard to complete this year’s target set out by the National Assembly. The socioeconomic situation in the third quarter saw positive changes, reflecting through growth in GDP, agriculture, forestry and fishery sector, and business registration. The Vietnamese economy expanded 5.93 percent in the first three quarters of the year, slowing from 6.53 percent growth in the same period last year. General Statistics Office Director General Nguyen Bich Lam said that low GDP growth in the first nine months of the year was driven by the mining sector. This sector recorded an increase of 0.2 percent in the first quarter but a drop of 5.3 percent and 6.8 percent in the second quarter and the third quarter respectively. In addition, the agricultural sector witnessed lower growth compared to a year ago. General Statistics Office’s System of National Accounts Department Director Ha Quang Tuyen said that GDP growth has maintained positive signs although it has not been high as expected. The economy grew 6.4 percent in the third quarter, accelerating from 5.78 percent in the second quarter and 5.48 percent in the first quarter. These positive signs have shown that GDP growth could be higher in the last quarter of this year. The agriculture, forestry and fishery sector showed a recovery in the third quarter while detracting in the first and second quarter of the year. In the first three quarters of 2016, the agriculture, forestry and fishery sector rose 0.65 percent. The sector is expected to make positive contributions to the annual growth of the economy in the remaining months of the year. Business registration has been flourishing since the beginning of this year with the establishment of more than 101,000 businesses. In addition to a strong increase of established businesses, the number of companies going back to trade and production activities after a long time of stopping operations went up nearly 60 percent in the first three quarters of the year compared to a year ago. Around 80.3 percent of surveyed companies in the manufacturing and processing sector indicated the business situation’s stability and improvement in the third quarter compared to the second quarter. In addition, about 85.6 percent of companies confirmed the business situation to be better in the last quarter of the year. Business confidence has been improved, creating a solid foundation for economic growth in the remaining months of this year, Nguyen Bich Lam stressed. It seems to be hard to complete the GDP growth target of 6.7 percent set out by the National Assembly. Nguyen Bich Lam said that to achieve GDP growth as high as possible, the central government, ministries, departments and localities must focus on six solution groups. Promoting the restructuring of the agricultural sector, strengthening economic development in rural areas, focusing on efficiently shifting crop and livestock structure to adapt with climate change and enhancing the application of scientific and technological achievements into production to heighten productivity, quality and effectiveness are required. The government and the Ministry of Agriculture and Rural Development need to adopt medium and long-term solutions to support for areas suffering from natural calamity, drought, salinity such as Mekong Delta, Central Vietnam and Central Highlands. Actively and flexibly implementing monetary policy in close cooperation with fiscal policy and other macroeconomic policies in order to control inflation under five percent is mentioned. The third solution group is to manage interest rates and exchange rate in accordance with macroeconomic developments and the domestic and international monetary market, effectively deploy measures to prevent tax losses and debts, accelerate disbursement of investment capital sources, especially the state budget and capital raised via government bond sales and strictly control public spending. The fourth solution group consists in improving the business environment, increasing national competitiveness, creating the most favorable conditions for trade and investment activities, protecting the legal interests of investors, encouraging businesses to invest in technology innovation and reorganizing production. The government, ministries, departments and localities have to implement strategic breakthroughs, accelerate economic restructuring along with growth model transformation and strongly develop potential sectors such as tourism, telecommunications, information technology, finance and banking. The government also needs to well implement social security policies and effectively deploy the national target program on sustainable poverty reduction during the 2016-2020 period. 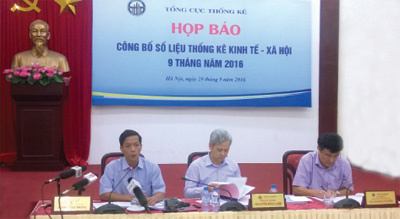 Among six solution groups, promoting the restructuring of the agricultural sector is seen as a top priority, Nguyen Bich Lam recommended.